This aloe is useful for landscaping a grassland garden. It looks spectacular when it is in flower. Aloe linearifolia is a small aloe which occurs as a solitary plant. It has narrow linear leaves, 250 mm long and 10 mm wide, with smooth margins. The leaves are spotted near the base. The inflorescence is a single, head-shaped raceme with short and tubular flowers up to 12 mm long. Flower colour varies from greenish-yellow to yellow or lemon-yellow and it flowers in late summmer, from January to April. It differs from the closely similar Aloe kraussii . This species is listed as Near Threatened (Raimondo et al. 2009). 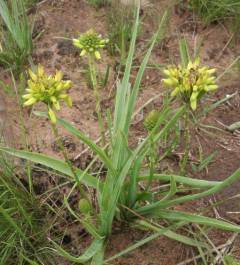 Aloe linearifolia is found in the grassland of southern and central KwaZulu-Natal. It grows well in full sun in gardens with temperate summers and with a good rainfall. It is frost-tolerant, but cannot withstand drought. Linearifolia means 'with linear leaves', the botanical term used to describe leaves which are long and narrow -more than twelve times longer than wide. It comes from the Latin words linearis meaning 'linear' and folius 'leaf'. 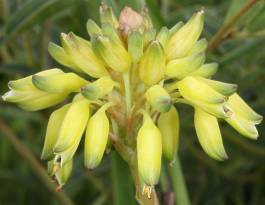 Aloe linearifolia is pollinated by sunbirds; which can reach the nectar in the flowers because they have long beaks. It is used in traditional medicine to treat tuberculosis, as protective charm and during initiation rites for girls. It does have considerable value as a horticultural subject. Aloe linearifolia is slow-growing, about 70 mm per year, and flowering begins in the third year. It is pretty enough to be used as a specimen or mixes well in an informal border. Plant in full sun. The area should be composted and watered well in the first few years. It grows best in high summer rainfall areas but can survive dry spells. It is frost-hardy. 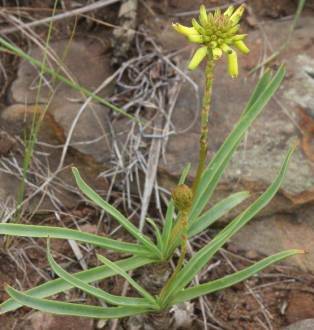 This species is particularly attractive while in flower because the leaves are bright green, almost without teeth on the margins, the flowers are lemon yellow and the leaves are well-spotted near the base. It also looks well when planted in compact groups. Aloe linearifolia can be propagated from seeds or by the division method. By Seed: Collect seeds in autumn while seed pods are stiil slightly turning black and before the seed pods open. Place in a paper bag to catch the fine seeds, which can be stored in the seed store or seed bank until the following spring. Plant in spring. Seed germinates easily. Sow sparingly in a well drained medium--a 50 : 50 mixture of sand and compost-- and place in a ventilated position to avoid fungal infection. Seedlings can be transplanted as soon as they are strong enough. By division: Cut new offshoots from the aloe plant with a sharp knife and plant in washed sand When they are well rooted they must be transplanted in a well drained medium. Court, D. 1981. Succulent flora of southern Africa Balkema, Cape Town. Grace, O.M., Klopper, R.R., Figueiredo, E. & Smith, G.F. The aloe names book. Strelitzia 28. South Africa National Biodiversity Institute, Pretoria and the Royal Botanic Gardens, Kew. Pooley, E. 1998. A field guide to wild flowers of KwaZulu- Natal and the Eastern Region. Natal Flora Publications Trust, Durban. Raimondo, D.,Von Staden, L., Foden, W.,Victor, J.E., Helme, N.A., Turner, R.C., Kamundi, D.A. & Manyama, P.A. (eds) 2009. Red List of South African plants 2009. Strelitzia 25. South African National Biodiversity Institute, Pretoria. Van Wyk, B.-E. & Smith, G. 1996. Guide to the aloes of South Africa . Briza Publications, Pretoria .